General Description: This perennial, herbaceous plant does not have stolons, grows to 3 feet tall or taller and stem and leaves exude a milky sap when broken. Leaves are primarily basal, though sometimes with a few stem leaves near base of stem. Yellow flowerheads in loose clusters. Flower Description: Flowerheads in open, round-topped clusters of typically 11-20, though can be more or less. Flowerheads composed of all yellow ray flowers with fused petals into a strap-like shape. Bracts at base of flowerheads have simple and gland-tipped hairs but do not have stellate (star-shaped) hairs. Leaf Description: Leaves primarily basal, 3-8 (-20+), and there may be a few stem leaves at the base of the stem. Leaf blades are narrowly elliptic to narrowly egg-shaped and have smooth to toothed edges. Upper leaf surface hairless or with few hairs, lower surface has hairs along midvein. Stem Description: Flower stems have hairs (1-2mm) that are simple, stellate (star-shaped) and/or gland-tipped. Fruit/Seed Description: The seeds are 0.06 to 0.08 inches (1.5-2 mm) and have 20-40+ white bristles (pappus) in a single series on one end. Each seed is ribbed with minute barbs. 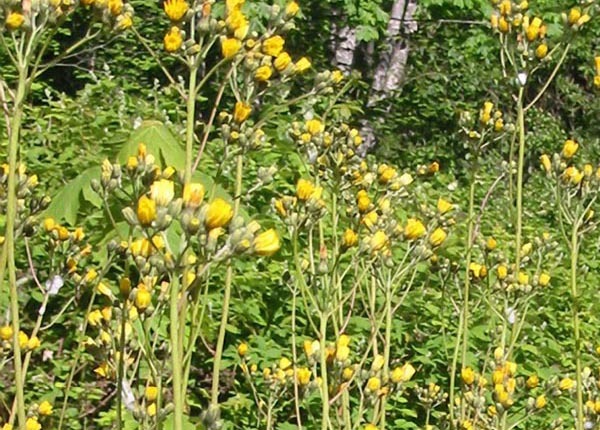 It appears to share the invasive characteristics of other hawkweed species already listed on the state noxious weed list as well as their negative impacts to rangeland and other habitats, especially in mid to upper elevations and in areas with low fertility soils.